St. Jude Medical, Inc. (NYSE:STJ), a global medical device company, today announced new data from Northwell Health highlighting the center's experience with the CardioMEMS™ HF System. The study demonstrated that monitoring pulmonary artery pressure with the CardioMEMS technology leads to significant improvements in quality of life (as measured by the Kansas City Cardiomyopathy Questionnaire [KCCQ]) and ability to exercise (using the six minute walk [6MW] test standard) in patients with chronic heart failure. These data were presented at the American College of Cardiology 65th Annual Scientific Session. "The data confirms that patients who are monitored using the CardioMEMS HF System are seeing significant improvements in the quality of their lives, including an increase in exercise capacity," said Dr. Rita Jermyn, director, Congestive Heart Failure Program at North Shore University Hospital, Manhasset, New York, part of Northwell Health. "We are excited to see independent data from centers implanting the CardioMEMS device and are very pleased to see such great results from Northwell Health," said Dr. Philip B. Adamson, medical director and vice president of medical affairs for St. Jude Medical. "The study data confirm benefits originally observed in our landmark CHAMPION study, which show patients who are monitored with the CardioMEMS HF System have a reduction in hospitalizations and an improvement in their quality of life." 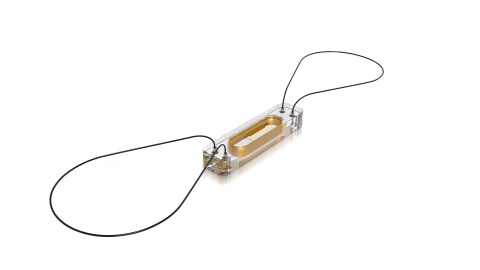 The CardioMEMS HF System uses a miniature wireless monitoring sensor implanted in the pulmonary artery to directly measure pulmonary artery pressure. Patients can transmit these data from home to their health care providers, allowing providers to stabilize pressure by managing the patient's medications more effectively. The CardioMEMS HF System is the first and only FDA-approved heart failure monitor that, when used by physicians, has been shown to significantly reduce heart failure hospital admissions and improve the quality of life in NYHA Class III patients. Long-term, prospective data published in The Lancet supports the effectiveness of the CardioMEMS HF System at reducing heart failure hospitalizations by demonstrating the system can provide physicians the opportunity to proactively manage their heart failure patients. The CHAMPION study originally demonstrated a statistically and clinically significant 28 percent reduction in the rate of heart failure hospitalizations at six months, and a 37 percent reduction in heart failure hospitalizations during an average follow-up duration of 15 months. About St. Jude Medical's Heart Failure BusinessSt. Jude Medical is pioneering heart failure disease management with innovative solutions like the CardioMEMS HF System, ground-breaking quadripolar technology, our first-to-market MultiPoint ™ pacing technology and, in select European markets, the HeartMate ™ 3 left ventricular assist system. St. Jude Medical collaborates with heart failure specialists, clinicians and advocacy partners to provide innovative, cost-effective solutions that help reduce hospitalizations and improve patient quality of life for heart failure patients around the world. About St. Jude MedicalSt. Jude Medical is a leading global medical device manufacturer and is dedicated to transforming the treatment of some of the world's most expensive epidemic diseases. The company has five major areas of focus that include heart failure, atrial fibrillation, neuromodulation, traditional cardiac rhythm management, and cardiovascular. For more information, please visit sjm.com or follow us on Twitter @SJM_Media. Forward-Looking Statements This news release contains forward-looking statements within the meaning of the Private Securities Litigation Reform Act of 1995 that involve risks and uncertainties. Such forward-looking statements include the expectations, plans and prospects for the Company, including potential clinical successes, reimbursement strategies, anticipated regulatory approvals and future product launches, and projected revenues, margins, earnings and market shares. The statements made by the Company are based upon management's current expectations and are subject to certain risks and uncertainties that could cause actual results to differ materially from those described in the forward-looking statements. These risks and uncertainties include market conditions and other factors beyond the Company's control and the risk factors and other cautionary statements described in the Company's filings with the SEC, including those described in the Risk Factors and Cautionary Statements sections of the Company's Annual Report on Form 10-K for the fiscal year ended January 2, 2016. The Company does not intend to update these statements and undertakes no duty to any person to provide any such update under any circumstance.